For some brides, picking the wedding gown is very simple, as they already have an idea on what to wear. Other brides might find the whole process overwhelming with no real idea what they want. In the end, every bride just wants to find something that makes her look and feel like a princess on this special day. This article will help you choose your ideal wedding dress. You have two questions that you should ask yourself. What style of gown am I going to wear, and where will I purchase the dress? 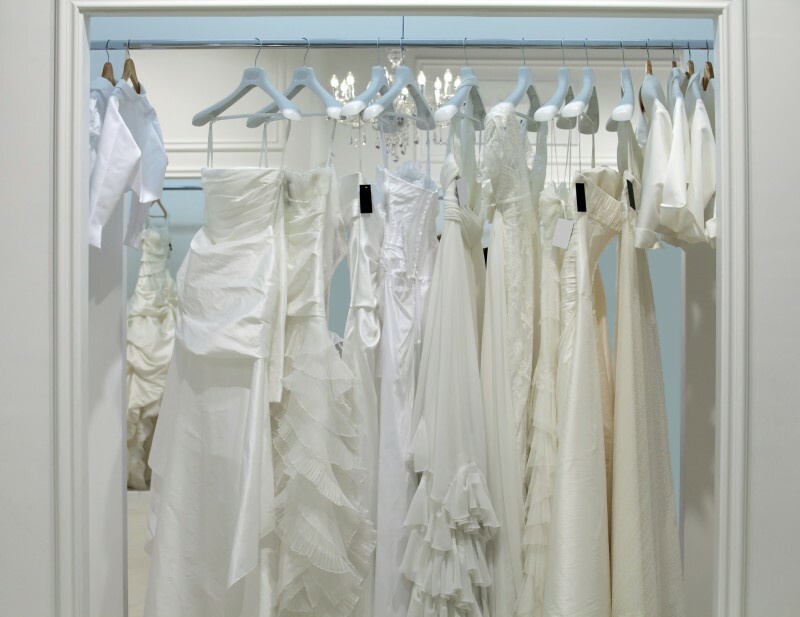 Pick approximately two or three bridal boutiques that provide a differing variety of gowns and schedule an appointment. Keep in mind a dress always appears very different on a model or on the hanger than it will on you! Although you may not like the style of a particular dress, you can truly be shocked to realise that it completely transforms your entire look for the better when you put it on. Be open minded to trying things you wouldn’t have thought of to see what works and what doesn’t. There’s a lot to take in when you’re looking at wedding dresses but one day you will wake up and just know what you really want. Some people say the dress should suit the wedding style. Personally, I have seen many weddings where traditional bridal etiquette has been totally brushed aside. For instance, a big fluffy dress at an informal beachside wedding, a glamorous beaded satin slip with a delicate sheer cathedral length veil for a very formal church ceremony, and a heavy crystal-adorned dress for a simple afternoon cocktail party. The reason these brides pulled off the look was that they chose a dress that suited them. When the dress complements your features so well, you will look beautiful no matter where or how your wedding is organised, and your guests will be truly stunned by your appearance. When you find a dress in a boutique and you fall in love with it, there is no need to keep looking elsewhere. That is, of course, unless the price tag puts it out of your league. When you get your heart set on a specific look that you just cannot afford, a professional bridal dressmaker can help create a similar look for half the price. You may find that you prefer the bodice on one style and the skirt from another dress. Don’t worry – it might be possible to combine one or two dresses and create an entirely new look. Simply ask about the styles that you like and check whether you are able to mix and match. While the majority of bridal boutiques stock dresses from different designers, some boutiques actually own their patterns and designs which is great for a bride that can’t make up her mind. A professional bridal designer can talk through what you want and can offer you help with picking the colours, fabrics and so forth, creating your perfect dress. The most important advice for bride is to be realistic and be confident in yourself. You need to be happy with yourself and learn to accentuate your positive features – there are always ways to avoid drawing attention to the bits you don’t like.